We’re on to the semifinal round of our 2018 Block of the Year bracket, where we’ll crown the best male and best female nominees of the year to clash for the title. It would appear our voters have a strong preference for alphabetization, as all four remaining blocks come from a player who is likely among the early names recited during a roll call. Or perhaps voters just like these defensive bids. Hard to know which is the stronger factor, really. Semifinal voting is now open and will close on Thursday, January 24th, at 3:00 PM Eastern. It should no longer be a surprise that Cardenas has a rabid following in these brackets. She has now earned a place in the semifinals in each of the three years we’ve run this online vote. This time she knocked off Amber Sinicrope to secure her spot, with something of an upset in the closest quarterfinal matchup. Will her luck continue and earn a second appearance in the final? In a matchup that received nearly twice as many votes as any other, Olivia Arellano ran past Japan’s Kaede Yoshida, much like she did with this block. The impressive Virginia teenager now faces off against a similar young phenom and former Block of the Year bracket champion. Perhaps her loyal supporters will boost participation and carry her incredible chase down block forward at least another round. As has happened in past years, a sizeable European contingent of voters is propelling one of their own through the bracket. The high-flying Dutchmen managed a relatively comfortable victory over the US’s Matt Gouchoe-Hanas in Round 2. De Jongh’s semifinal draw pits him against one of the most shared highlights from the USAU Club Championships. Alanguilan may have just squeaked by Hunter Taylor in Round 1, but he routed his Australian opponents in the second round. It is still astounding watching just how much ground the Chicago Machine block generator covers while this pass is in the air. If the Ultiworld voters are anywhere close to as excited about his effort as the woman in white on the sideline in this clip, Alanguilan could find himself advancing to the final in this bracket. 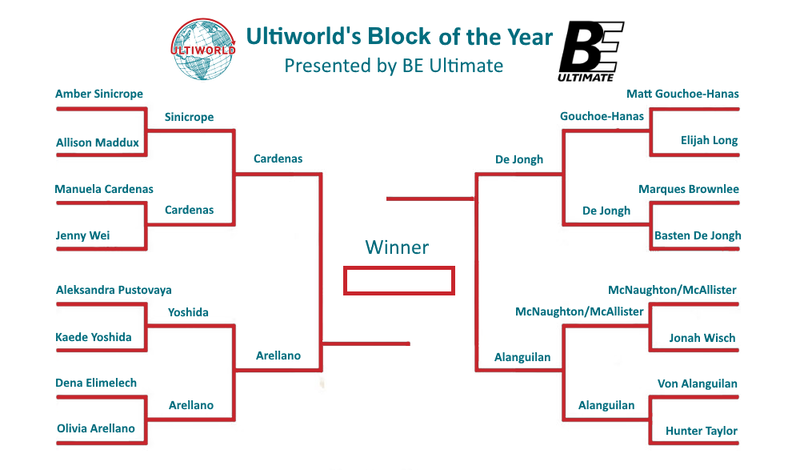 Comments on "Ultiworld’s 2018 Block Of The Year Bracket: Semifinals, Presented By BE Ultimate"